A University of Texas at Austin scientist, working with an international research team, has developed the most precise sequence map yet of U.S. cotton and will soon create an even more detailed map for navigating the complex cotton genome, which may lead to an inexpensive version of American cotton. AUSTIN, Texas – A University of Texas at Austin scientist, working with an international research team, has developed the most precise sequence map yet of U.S. cotton and will soon create an even more detailed map for navigating the complex cotton genome. The finding may help lead to an inexpensive version of American cotton that rivals the quality of luxurious Egyptian cotton and helps develop crops that use less water and fewer pesticides for a cotton that is easier on the skin and easier on the land. Z. Jeffrey Chen and his collaborators, Tianzhen Zhang and Wangzhen Guo at Nanjing Agricultural University (NAU) in China, describe the new draft genomic sequence in a paper published today in Nature Biotechnology. Chen and another group of scientists also learned earlier this month that they will receive $2.3 million in funding from the National Science Foundation to take the draft road map to completion. Having a detailed genetic road map of an American crop that has recently fallen on tough times could prove critical to the industry. Cotton is known as the most important renewable fiber crop, and its seeds and oils are used in food for humans and livestock, as well as in fertilizer. The species of cotton Chen’s team is sequencing is Upland (or American) cotton (Gossypium hirsutum), which makes up 95 percent of all cotton grown. A well-defined map of the Upland cotton’s genome would allow researchers and growers to better understand the interactions between genes that determine the species’ ability to produce better fibers and oils in seeds. The U.S. is a leading exporter of cotton, and Texas grows more cotton than any state, producing nearly 30 percent of the nation’s supply. The crop generates an estimated $2 billion per year for the state’s economy, but droughts and other weather-related changes since 2010 have led to steep losses for Texas cotton farmers, with yields down in some areas by as much as 50 percent. Within this context, scientists have made several efforts to sequence the cotton genomes. The task is complicated for Upland cotton, a plant formed by two ancestral species 1.5 million years ago and that carries twice as many copies of genes as the presumed parent plants. Sequencing parent species, as previous researchers have done, is relatively easier but offers only a rough approximation of American cotton, much the way that using a map from the 1800s would provide incomplete information for someone trying to navigate a modern city. 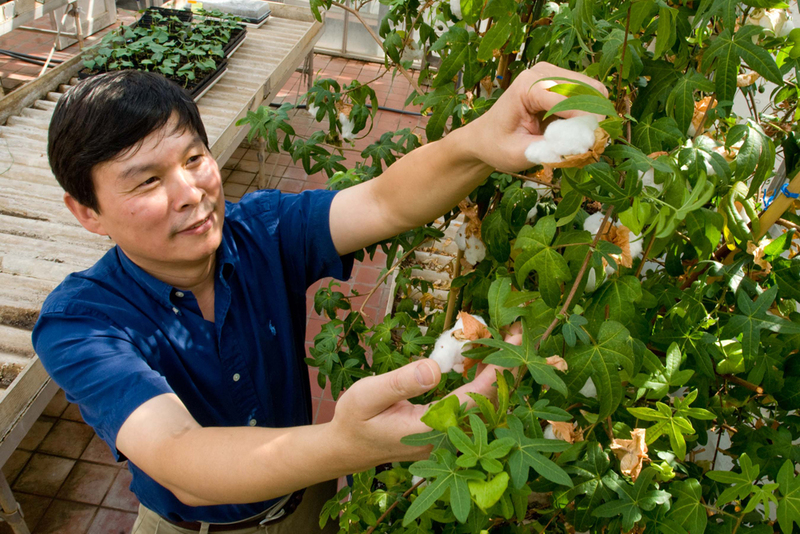 “This sequence will accelerate genetic and breeding improvement of cotton production,” said Zhang, director of the Cotton Research Institute at NAU. David Stelly of Texas A&M, a collaborator with Chen on both the paper and the new grant, noted that the draft cotton genome sequence will be a “game-changer,” launching a new era in cotton research, education and breeding. Although the new map is accurate, with the new grant, Chen and researchers from Texas A&M University, Clemson University, Alcorn State University and HudsonAlpha Institute for Biotechnology will create a higher resolution or “gold standard” map of the Upland cotton genome. Their novel sequencing method will be able to account for changes that occurred in Upland cotton over more than a million years and could also be applied to other important crops. The research from Chen and colleagues in China published today was written with contributors in China, Australia and the United States from Novogene Bioinformatics Institute, Clemson University, the U.S. Department of Agriculture, Texas A&M University, the Shanghai Institutes for Biological Sciences, the Commonwealth Scientific and Industrial Research Organization, Mississippi State University and Cotton Incorporated. U.S. funding for the project came from the National Science Foundation and Cotton Incorporated.